The debate over offering universal health care in the United States was the focus of a project undertaken by seniors in the New Vision Health program at the Bohlen Technical Center as views both for and against this system of care were presented as part of a class project. According to instructor Danielle Denney, the student’s interest in health care economics was piqued after the class viewed several documentaries on how health care is offered in the United States and in other countries. 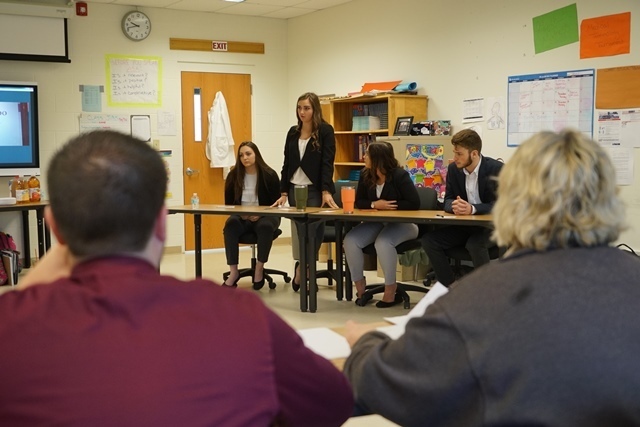 That led to the decision to present the idea behind universal care in the form of a debate called “Robin Hood Medicine.” Students were assigned to be either on the pro or con side of the debate and then research the topic at hand to try to make the case for their side. The debate was held on April 4 with a volunteer panel of judges from the local health care field visiting the classroom to hear both sides. Those judges were Julia LaPorte, Ft. Drum Regional Health Planning Organization; Stephen Jennings, Jefferson County Public Health; Debbie Singleton, South Jefferson Rescue Squad; and Aaron Naklick, Samaritan Medical Center. Each side was given equal time to make their point and counterpoints to the specific issue that was addressed, which covered a wide range of topics associated with universal health care. Those topics included whether or not universal care would allow for more preventative treatment in the U.S., whether the country could afford such a health care system, what would the impact be on those currently working in the medical field, is health care a right for citizens, and the differences between the United States and other countries that could impact the viability of universal care here. The debate judges were also given opportunities to ask questions of the students. This created a unique interactive education opportunity for the New Vision class as the students were able to gain insight and opinions from those working in the health care field. DaYana Henry, a senior at Watertown High School, says the research she conducted to prepare for the debate opened her eyes on different aspects of the health care issue. The group of judges praised the students for their hard work and preparation heading into the debate, noting it was a complicated issue that has no clear-cut solution. Regardless, the topic proved to be an excellent learning opportunity for the class as they look ahead to a variety of possible careers in the health care field.